These are some fine felt bags! Plus, they serve a mechanical purpose. The button unsnapping seals your fate. We all know the tale of Robin Hood, the dashing brigand who steals from the rich to give to the poor (and often ends up defeating the Sheriff to end the cycle of extortion and greed in the stories). But this time, like Worf from Star Trek, you are not a merry man. Why risk your neck defying the law and stealing from the rich when you can just sell to the rich and make boatloads of money for yourself? Time to pack your merchant bags and ready your papers, because you’ll still need to deal with the Sheriff to get your goods – illegal or not – into town. 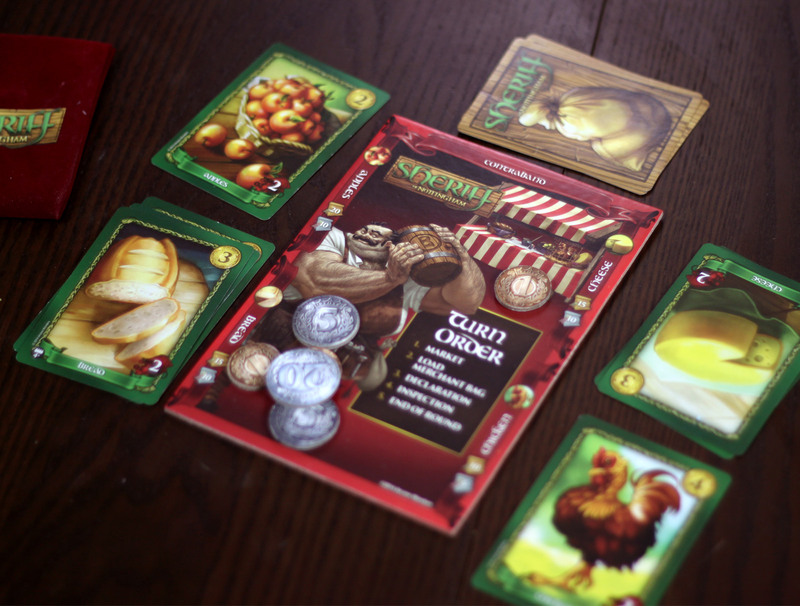 In Sheriff of Nottingham, players are tasked with trying to make the most money by importing goods past the sheriff’s inspection. Of course it’s far more lucrative to sneak in illegal goods, but if you get caught with them in your bag, you’ll have to pay up. Fortunately, the sheriff has a language you know how to speak that may convince him to let you by uninspected. That language, of course, is pure, venerable coin. 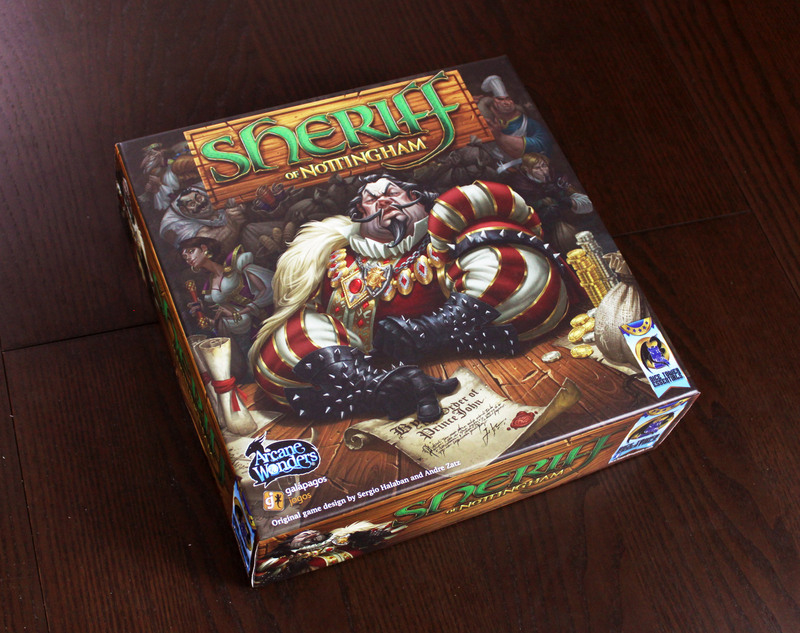 Each player will take a turn playing the role of the sheriff for a round while the others try to get their goods to the market. 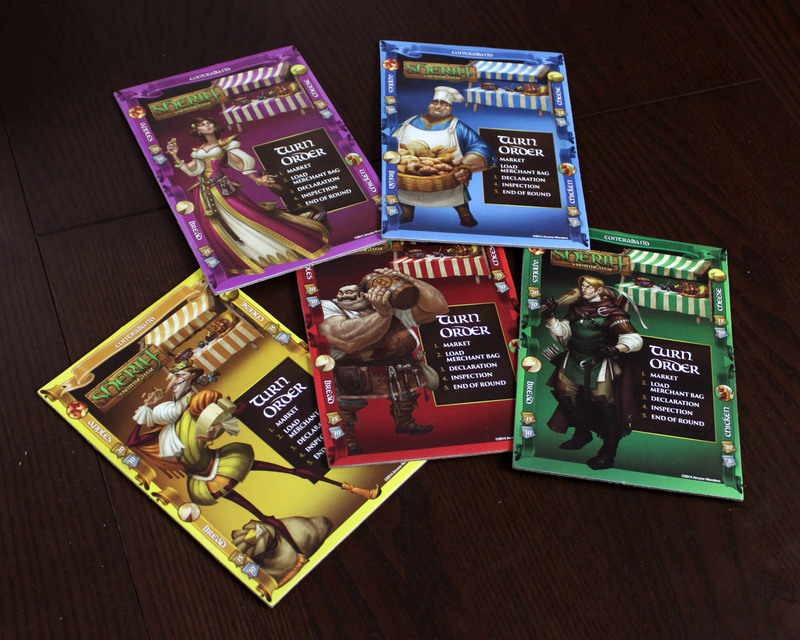 In a round, each merchant player has a chance to discard cards from their hand and then draw new ones – either facedown from the deck, or face-up from two discard piles. Get yer goods, get ’em cheap! Merchants will then load their merchant bags with goods – either legal or illegal – snap the bag shut, and hand it over to the sheriff. When they hand it over, they must make a declaration of what is in their bag. When a player declares their goods, first of all they must not lie about the number of cards in their bag. Then, they can only declare ONE type of good, and it has to be a legal one. Of course the actual contents of the bag, aside from the number of cards, can be completely different than what was declared. Once all the bags have been handed over to the Sheriff and declared, the Sheriff must then decide whether or not to inspect each bag. If he chooses not to inspect, the merchant player gets to keep every card whether it was legally declared or not. If he chooses to inspect, there are two possibilities. If the bag has any undeclared goods (including contraband, or legal but undeclared goods), the merchant must pay a fine – each card, in addition to its gold value, has a penalty listed on it. However, even if some of the goods were illegal, the merchant gets to keep any cards that were declared legally – so if I say I have 5 apples, but I really have 3 apples and 2 crossbows, upon inspection I would have to pay a fine for the crossbows (and lose those goods) but at least I keep the apples. Don’t mess with the Sheriff. Or if you do, be prepared to pay up with some cash. If a merchant has been totally honest when their bag is inspected, then the Sheriff must pay the penalty to the merchant instead, and the merchant keeps all their cards. As the Sheriff is deciding what to do and who to inspect, merchants are free to negotiate – I probably mean bribe – to get what they need. Pay up to avoid inspection, or pay to get someone else inspected. Pay with gold, or pony up some goods from your bag or from your merchant stand. All deals are binding, except for two; if you promise the sheriff a thing in your bag, and that thing is not in your bag, you owe nothing. Or, if you promise on a future round that you’ll not inspect a player (or any other future-round promise), that deal is not binding. Once everything’s been sorted out, the Sheriff passes to the next player and everyone refills their hand from the draw deck. The game ends when everyone has been Sheriff twice (or three times in a 3-player game). At the end of the game, additional bonuses are scored for each player who has the most or second-most of a type of legal good. Some contraband goods, however, count as extra goods for this purpose. Players then greedily count up their gold and the value of their goods, and whoever has the most money, just like in real life, is the winner. Seedy merchants. Ruffians, the lot o’ ya! In previous reviews, we’ve discussed the idea of a “distilled” game – that is, a game that takes one mechanism and distills it down to its purest form, and leaves everything else out of it. 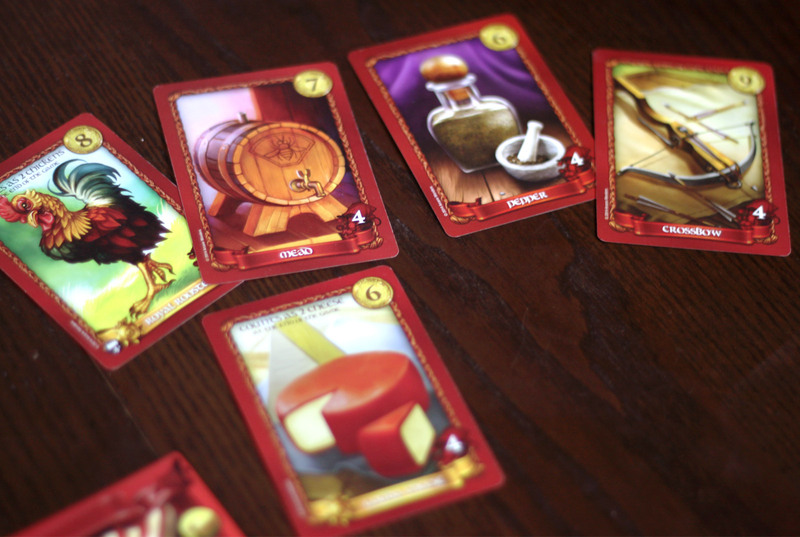 For Sale is the distilled auction game, Coup is distilled bluffing. Sheriff of Nottingham does the same for negotiation. That’s pretty much the sum of everything here; the cards, the set-collection, the bluffing, it’s all dumbed down to put the focus on where it belongs: how much are you willing to pay. Or, you might say, how little CAN you pay to sneak your goods through. Fortunately, because it’s all so straightforward, it works. This is a very accessible game, perhaps surprisingly so. At least in my family, the cutthroat yet open-ended nature of this sort of bribery and bluffing does not scream “play me!” but after introducing it to them, they were hooked. It’s just fun to pay far less than you should to sneak your illegal goods in, or convince the sheriff that you’re totally clean when you’re not. It’s even fun to try and convince the sheriff that you MIGHT have illegal goods by pretending you don’t, and tricking him or her into inspecting your perfectly legal shipment of cards. What really makes this work, though, besides the easy-to-learn rules, is that the game sets up a framework for bribery and deception that is easy to grasp. As the rulebook itself declares (and is quite wise to do so), if you get inspected you’re going to have to pay up – so you might as well throw in a bribe. The value of the good and the cost of the penalty give you a very clear range of bribery to work with. If you pay more than the value of the goods you’re receiving, you’re paying too much. If you pay more than the total value of the penalty you would end up paying, you can make it more lucrative for the Sheriff to give you a free pass than to inspect you, but still make money in the deal. Obviously you want to try and pay as little as possible – and convince the sheriff you’re making it worth her while – but those values give you an idea of how much to spend. In a game this open ended, one would expect new players to be at a loss of what to do. Sheriff of Nottingham makes it pretty easy to figure out. Contraband is the spice of life. Or at least wealth. It’s also nice that the game lets you keep legally declared goods even if you weren’t totally honest. That encourages players to try and build as big of a set of legal goods as they can, but still toss in an illegal good or two. The game would be no fun if players never wanted to risk anything illegal, but it would be too punishing if it was all or nothing. There’s a perfect balance between risk and reward that pushes players towards risk while letting them decide how much of it they actually want to take. It pushes people into participating. The rules of this game are especially well written. Everything is very clearly defined– you know when a deal is binding. You know when it’s too late to avoid inspection (when the button snaps open), or when you’re safe (as soon as the Sheriff offers your bag back to you). There’re clear, strict guidelines on how to declare goods. Those restrictions serve to erase confusion and make the goals of the game very clear. Yet they still allow creativity in how you approach your sheriff. Do you pack a bag full of contraband and pretend like you’re completely innocent? Do you pack a perfect set and then pretend to try and bribe the sheriff? Do you pack your bags full and slip only one or two illegal goods? It’s up to you, and there are many ways to score big, or to mislead the sheriff. Trying to figure out new ways to maximize your points is what keeps the game fresh. Well, okay, this game isn’t perfect. 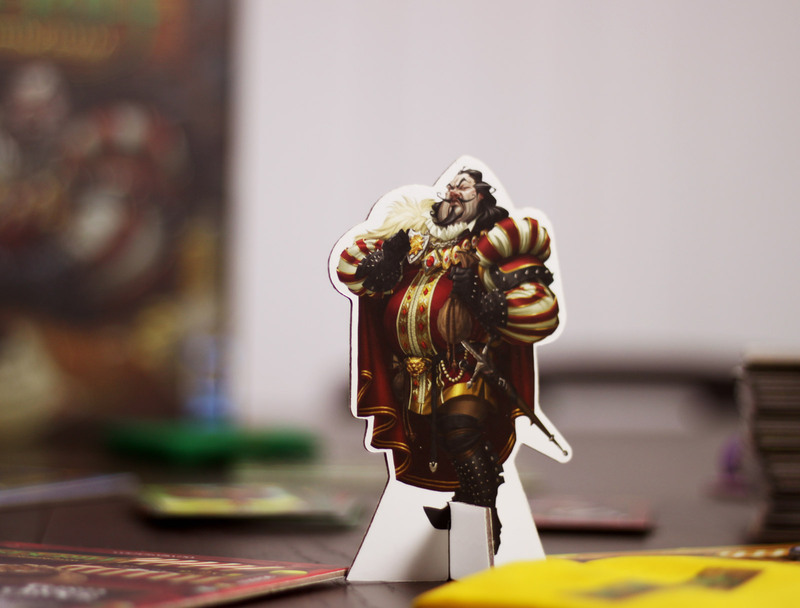 Speaking of “keeping the game fresh,” I do feel that Sheriff of Nottingham will not stay as fun and exciting after playing it too often in too short of a time. While there are many ways to approach the game as a merchant or as the sheriff, there are not infinite ways – and you will most likely use them all in a single game. It’s nice that everyone gets a turn playing as the sheriff, but that also means you play every role in every game. In a comparable social game, such as One Night Ultimate Werewolf, replay value comes in the different roles, and that you will only play as 1 role each game. Sure, you’ve been a Werewolf, but have you tried being the Tanner? What about the different mixes of roles and how that changes the game? In Sheriff you don’t have the benefit of having different goals or abilities each game, so it can become repetitive after many plays. Compounding this slightly is the length of the game – while other “distilled” games come in shorter 10-20minute bursts, Sheriff of Nottingham lasts at least an hour, possibly even 90 minutes. It’s a fun game and you can certainly be engaged the whole time you’re playing, but it does tire you out. While it could be a great filler game in style, the length prevents you from pulling it out for a quick round – and the nature of the game doesn’t work well if you shortened it. Still, that doesn’t change the fact that this is a fun game, and a very engaging, accessible experience. 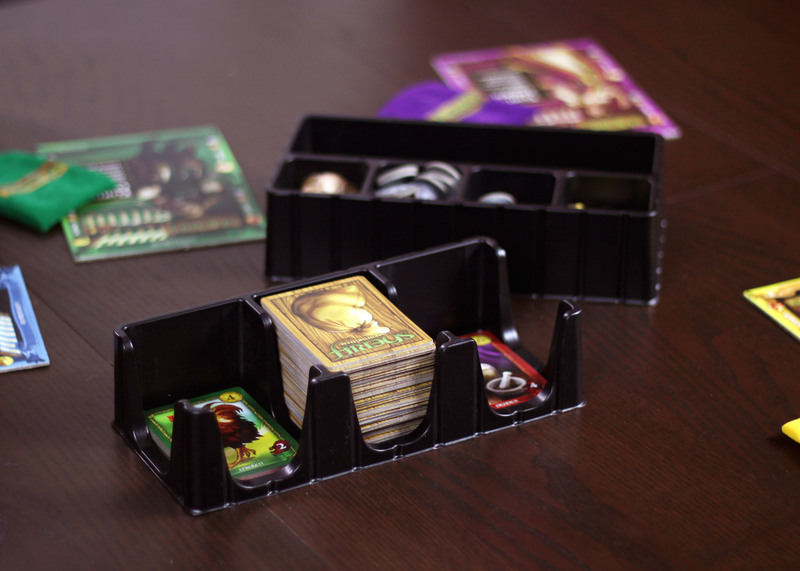 You may not want to pull it out every game night, but that’s okay. It’s a game that can sit on the shelves for awhile until its time comes around again, and the rules are so easy it won’t be difficult to get right back into the swing of things. 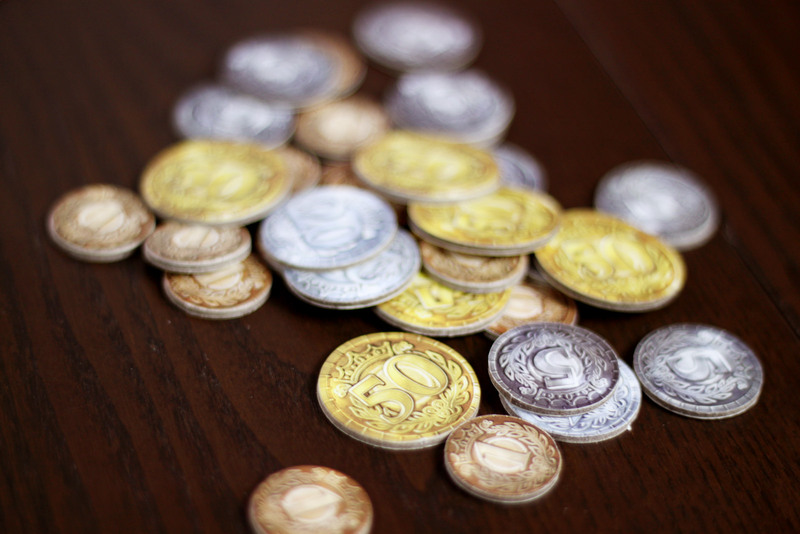 The components are pretty good – the thick cardboard coin tokens are very nice, and the player boards are laid out cleanly with fun art depicting the snotty, arrogant merchants on them. The cards feel a little thin to me, but they’re all right – and there are a ton of them, so thicker cards wouldn’t be all that welcome. More importantly, the cards are easy to read with the goods clearly depicted and the value and penalty numbers are visible from across the table. The bags are fantastic. 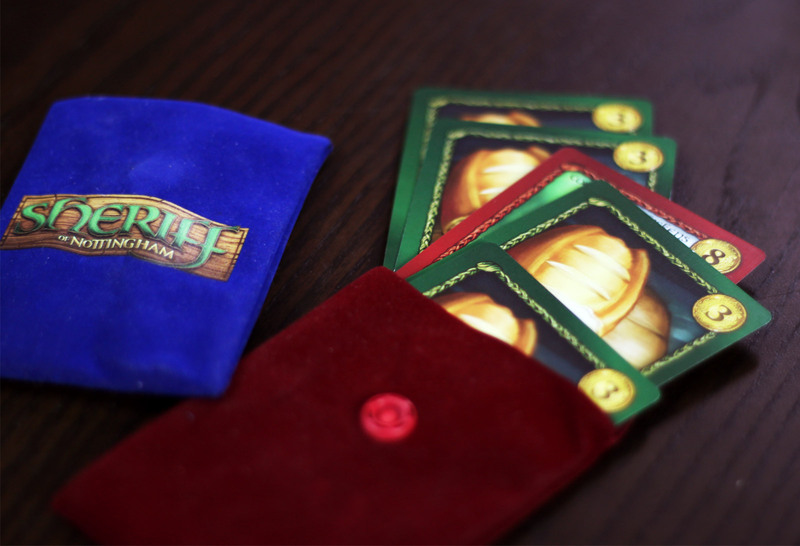 Brightly colored and made of felt, they fit your cards perfectly and snap shut cleanly. It adds a lot to the experience of the game to have these beautiful, tactile bags to stuff your goods into. Finally, the game’s insert is actually worth mentioning – it comes in two parts that can easily be removed from the box for use during gameplay. The coins are separated into types and deep enough so that in general the coins stay in the tray, and the second for the cards is divided into 3 parts so you can have a draw pile and two discard piles. Classy! These come in the box. Use them, if you like, or don’t, but… nice. 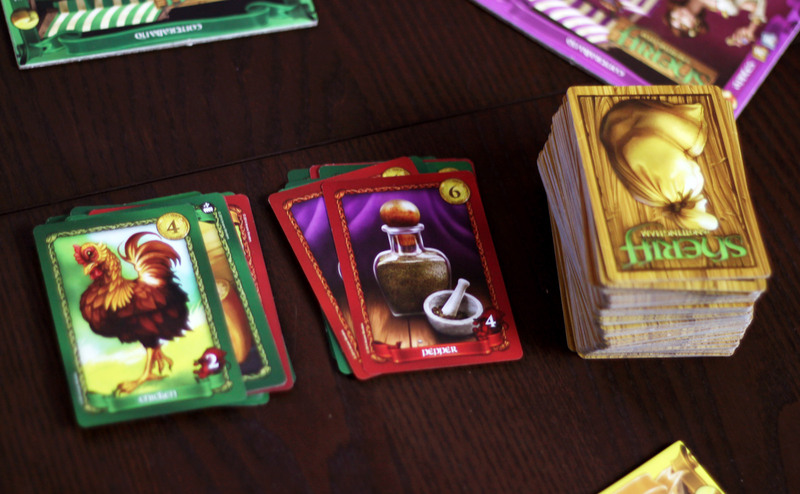 Sheriff of Nottingham is a very clever game that does an excellent job of streamlining its primary mechanism – bribery – down to a pure and accessible form. It’s a lot of fun to play, and even if it can get a little repetitive if you play it too often, it’s a welcome game to keep on the shelf for a unique social gaming experience. It’s easy to learn and the clear rules and obvious card values make it fun for almost anyone. Even your most innocent friends will be bribing and bluffing their way to riches in the time it takes to pack a small felt bag with a handful of cards. iSlaytheDragon would like to thank Arcane Wonders for providing a review copy of Sheriff of Nottingham. Next Article Game of the Year 2014!